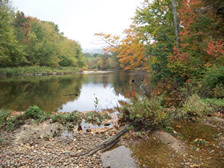 Acquisition History: The New Hampshire Fish and Game Department acquired this property through the Land Conservation Investment Program (LCIP) who purchased the property in 1988. Description: The Pemigewasset River WMA includes over two miles of frontage on the Pemigewasset River. It includes a one-acre island in the middle of the river and approximately 33 acres of floodplain forest with a few old fields dominated by grasses and forbs. Common Wildlife: Common wildlife includes white-tailed deer, turkey, grouse, and American woodcock. A diversity of songbirds can be found using the property especially during spring and fall migration. The quiet backwaters provide habitat for waterfowl and the stretch of river associated with the WMA houses a trout fishery and breeding habitat for Atlantic salmon. Directions: The property may be accessed by way of Interstate 93 north to Exit 28. Take a left off the exit and the first right onto Owl Street. Follow Owl Street under I-93 and take a left into the entrance for the Owl Brook Country Club (Pemi River Rd). Approximately 500 feet north of the intersection of Owl Street and Pemi River Rd. will be a golf cart path on your left. Park there, but don’t block the path. A legal right of way for pedestrian access has been provided by the Country Club. Follow the cart path west and then skirt the edge of the golf course west and then north until you reach the river. Take a left and walk under I-93. The WMA starts on the other side of the interstate. Although located on the water, there is no boat or canoe access on this property because of the difficult access.